The texts are only in Russian. As one of my readers said, "nobody cares about a text, give us photos!" 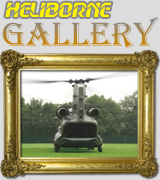 If so, you can see some pictures in my 'HELIBORNE Gallery' section; there are descriptions in English. Plus I have placed several links to pages with my photo reports from airshows and exhibitions (see below). I shall be glad to hear from you. Please note e-mail link contains a spam protection. If you are interested in a review of your modelling goods (helicopter modelling, tools, etc.) you can send me a sample. Postal address by request. Review guaranteed! ©1999-2014, HELIBORNE, Yevgeny Borissov (IPMS World Helicopter SIG).